Though Kakivik has been primarily Alaska-based since its inception some 15 years ago, the company has also been providing specialty inspection services for ConocoPhillips’ Australasia Business Unit since 2012, receiving a number of awards and accolades in the process. Our unique ability to detect external corrosion of insulated piping without removing the insulation has saved our clients tens of millions of dollars. Kakivik’s corrosion under insulation (CUI) services that Kakivik offer significant advantages for a wide range of facilities, including offshore platforms, gas processing plants, refineries and petrochemical installations across the world. Even with the downturn in oil prices, CUI inspections are critical to ensuring the safety of people and facilities, and Kakivik’s process of inspection provides significant cost and time advantages over more traditional alternatives. 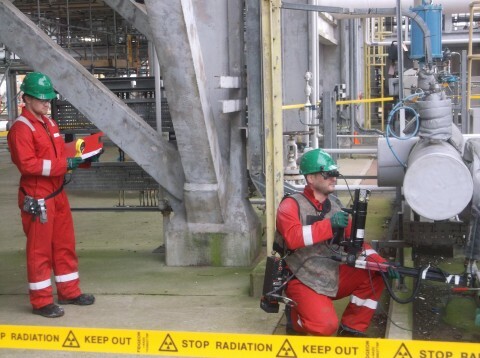 Kakivik’s Dlaton Pearson and Dave Arnett performing CUI inspections in the UK. Kakivik is in active discussions with a number of prospective clients in Indonesia and Australia, as well as exploring potential opportunities in the Gulf Coast region of the US. In addition, two of our inspectors recently completed a demonstration project for ConocoPhillips in the United Kingdom (UK) for which results were very encouraging. We expect addition CUI crew deployments to the UK and Southeast Asia/Australia in the coming months.